Venturing further away from nest and learning "safe escape routes"
Based on your selection, this mammal appears healthy and may be a candidate for renesting and/or releasing back to your yard, based on your responses to additional questions. Wildlife have a far better chance of survival when raised by their own species. Follow the instructions in Step 3 for renesting and/or releasing. Additional details are also available in the FAQ at the bottom of this page. This mammal has been separated from its mother for too long and should be evaluated by a wildlife rehabilitator, who can determine whether the cottontail is healthy enough to attempt to reunite it, or whether it should remain in care. 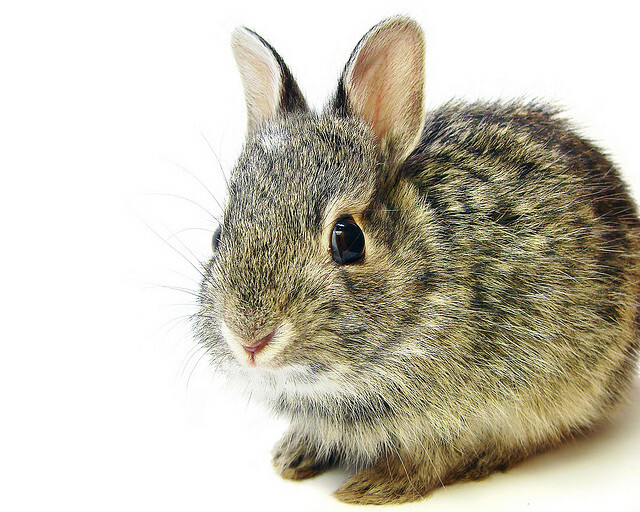 If you have found baby cottontail rabbit, you can use this form to determine whether you should take it to a wildlife rehabilitator for continued care or return it to its nest or your yard. Additional information for each question can be viewed by hovering over the blue information icon located next to the question. Please contact a wildlife rehabilitator if you have additional questions or need further assistance. 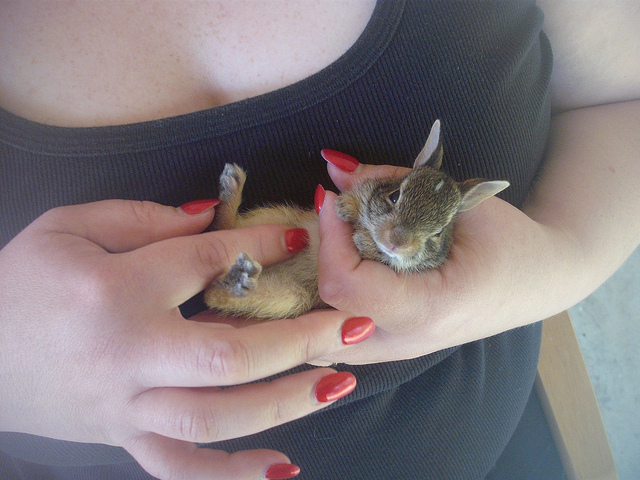 As with all wild animals, please use caution when handling young wildlife. Wildlife don't understand that you are trying to help them, and even babies can bite. If this cottontail is still nursing (under 3 weeks of age), it has missed several meals. It should be evaluated by a wildlife rehabilitator, who can determine whether the squirrel is healthy enough to attempt to reunite it, or whether it should remain in care. This healthy baby should be returned to its nest and monitored to insure mom is returning to feed it. Refer to the FAQ below if you have questions about renesting. This healthy baby should be returned to your yard in an area near its original nest (if you know the location) or under a covered area such as tall grasses, bushes or a brush pile. Refer to the FAQ below if you have questions. 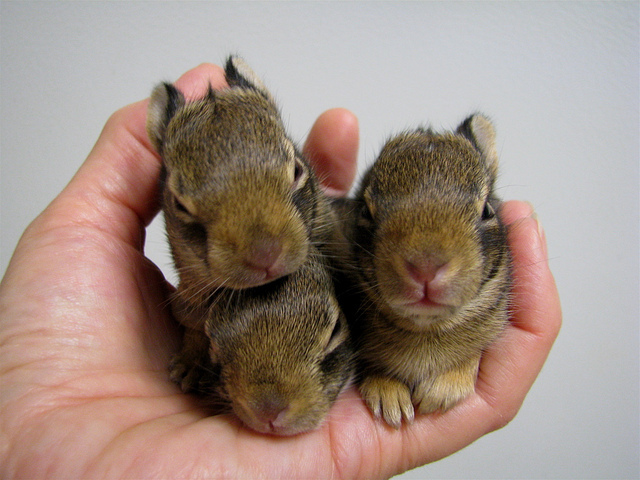 How do I renest baby bunnies? Return the baby to the nest and lightly cover it with the fur and grasses. The babies will usually stay put if they feel adequately hidden. If they are older and keep bouncing out, keep your hand over them covered nest for a few minutes until you feel them settle down. This should make them feel safe enough to stay put. View the answers to other questions below if you have concerns about the nest location. How do I monitor a nest to make sure mom is coming back to feed the babies? 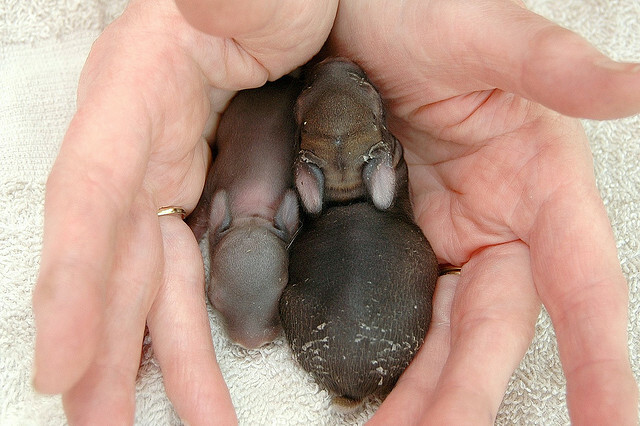 A successful bunny renest is determined by checking on the babies during the next 3 mornings, during which you should be able to see a "milk line" at the tummy showing that the babies were recently fed. The babies should look plump and be "bouncy" when touched. Use the guide above to assess their physical condition. 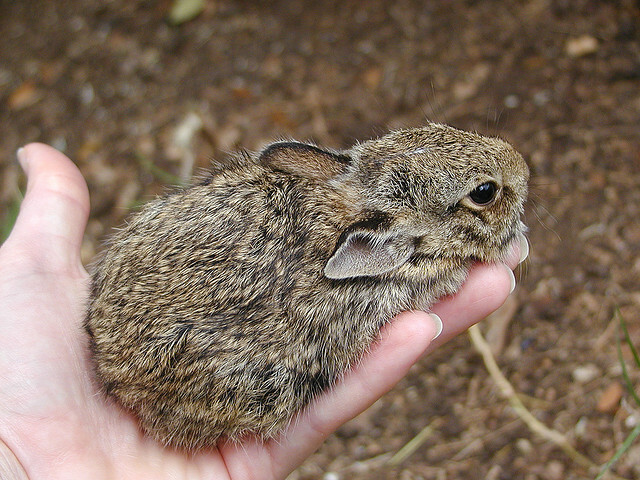 I found a baby bunny and it is healthy, but I can't find the nest. Cottontail nests are almost always "hidden in plain site". The "nest" (which is really just a shallow depression in the ground) will be covered with grass or mulch and sparsely lined with the mother's belly fur. It is usually located in high grasses, under bushes, inside mulch beds, in a patch of grass that looks dead, or in flower beds. Return the baby to the nest and lightly cover it with the fur and grasses. The babies will usually stay put if they feel adequately hidden. If they are older and keep bouncing out, keep your hand over the covered nest for a few minutes until you feel them settle down. This should make them feel safe enough to stay put. I understand that I should return this healthy bunny to its nest/my yard, but I would be more comfortable taking it to a rehabilitator so that it can be raised and released in a safer location. Young rabbits have a higher survival rate when they are raised by their mothers and can disperse from a familiar location (where they were raised). Bunnies are very prone to stress-related health issues, which is fairly common when they are raised by humans (which they perceive to be predators). This is further compounded by the fact that most rehabilitators have to release young rabbits in unfamiliar environments, where the rabbits only have a very short time frame to figure out where to get food, shelter, and hide/escape from predators. 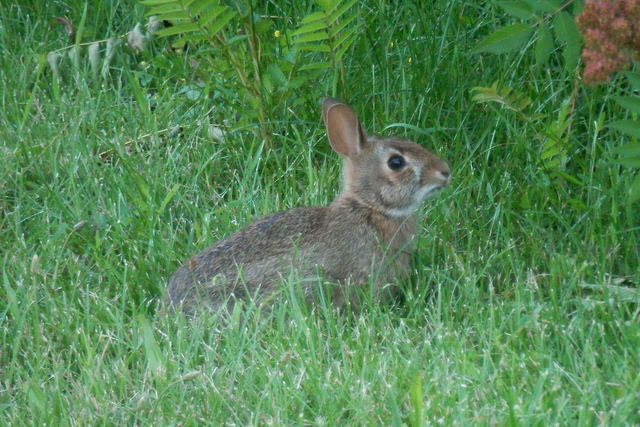 By allowing a rabbit to be raised by its mother and disperse from a familiar location (your yard), you are greatly increasing its chances of survival. I found a nest but I have not seen the mother come to feed the babies. Are they orphaned? Mothers leave the babies unattended ALL DAY, only to feed them a few times a day, especially pre-dawn and after dusk. You will NEVER see the mother. It only takes her a few short minutes to return to the nest to feed them, after which she quickly leaves to avoid attracting predators. 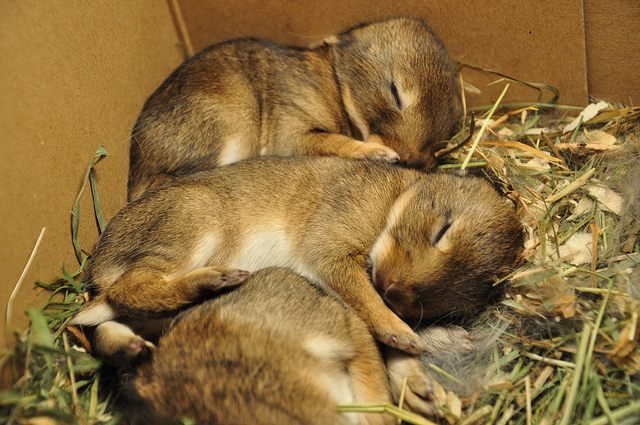 I have pets and children and am worried that they will discover the nest of baby bunnies. If the babies are older, you can parition off a small area with temporary fencing near the nest and add a small brush pile that the babies can use for cover as they venture around. Before letting pets outside, visually scan the yard for babies and clap loudly so that they take cover. Supervising kids and pets while they are in the yard is also helpful. Fortunately, bunnies disperse fairly quickly and your yard can return to normal afterward. We accidentally ran over a rabbit nest when mowing for the first time this year. One of the babies was killed but the others look okay. What should we do? Carefully examine the remaining babies, evaluate them to insure that they are not injured (use the guide above to confirm they are healthy), return the healthy babies to the nest (take any injured babies to a rehabilitator) and cover them up. You can place clumps of grass around the nest if you want to give it cover, or place a perimeter fence around it which has 2x4 or 4x4 inch wire to exclude children and pets. If you would prefer not to place anything around the nest, you could increase the depth of the nest (which is really just a shallow depression lined with fur and covered with grass) to provide the babies with more cover before returning the babies. If you elect to do this, please monitor the nest during periods of rain to insure it doesn't flood. The next time you need to mow, cover the nest with a laundry basket. The babies will grow very quickly and may bolt in fear when the mower is nearby; the laundry basket prevents any more accidents from occurring. 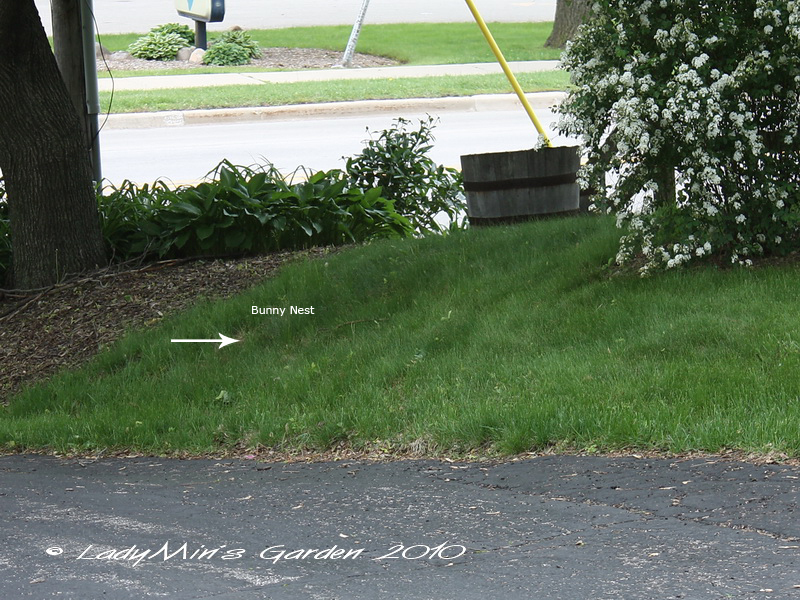 In the "Rabbit nest pictures and videos" section below, you can see how common it is for rabbits to nest in the middle of manicured lawns. We discovered a bunny nest but need to do lawn work or construction nearby. If you need to mow or work near an active bunny nest, consider temporarily covering the nest with a laundry basket or a small section of wire fence. This will allow you to safely work near the nest while preventing any injury to the babies or having the babies "bolt" away in fear. My dog or cat killed a baby bunny. How do I prevent them from going back to the nest to get the other babies? The only guaranteed option (until the babies disperse from your yard) is to supervise dogs while they are outside and to keep cats indoors. If this is not an option, surround the nest by enclosing it with 2x4 or 4x4 inch wire fencing (garden fencing) to exclude pets. The openings will still be large enough for mom to reach the babies. Before letting pets outside, visually scan the yard for babies and clap loudly so that they take cover. Supervising pets while they are in the yard is also helpful. Fortunately, bunnies disperse fairly quickly and your yard can return to normal afterward. We just had very heavy rains and the nest and babies are soaked. Is there anything I can do? If the nest is a soggy mess and the babies are wet, they will quickly lose body heat and possibly die. If you want to assist them you will need to both warm and dry the babies as well as replace the wet nesting materials with dry nesting materials. You will need to do this quickly, both for the babies' health and so that they are returned in time for their mother's next visit for feedings. Babies: Gather up all the babies and place them in a small box lined with a handtowel. In a quiet room, place half of the box on a heating pad and allow the babies to gradually get warm and dry. If necessary, you can use a blowdryer set on low to gently dry the babies inside the box from above. Once they are warmed, you should evaluate their health using the guide above. Contact a wildlife rehabilitator they are still not active after being warmed, or their condition deteriorates. Nest: Remove the wet nesting material and set it aside somewhere where it can dry out. You should now just see a shallow depression in the soil. Gather up some new nesting material from your property such as dry grasses, leaves, along with soft hay or straw. Refer to the nest pictures at the bottom of this FAQ as a guide. Re-line the nest with two-thirds of these new materials into a bowl shape. If the ground is still very soggy/wet, you may want to add a little extra nesting material in the bottom to raise it slightly. Return the warm/healthy babies to the nest and lightly cover them with the remaining one-third of nesting material or the original nesting material (if it is dry). If the original nesting material is still wet, place a just small amount around the outside of the nest. The babies will usually stay put if they feel adequately covered and hidden. If they are older and keep bouncing out, keep your hand over the covered nest for a few minutes until you feel them settle down. This should make them feel safe enough to stay put. Cottontail nests are almost always "hidden in plain site". The "nest" (which is really just a shallow depression in the ground) will be covered with grass or mulch and sparsely lined with the mother's belly fur. It is usually located in high grasses, under bushes, inside mulch beds, in a patch of grass that looks dead, or in flower beds. Return the baby to the nest and lightly cover it with the fur and grasses. The babies will usually stay put if they feel adequately hidden. If they are older and keep bouncing out, keep your hand over them covered nest for a few minutes until you feel them settle down. This should make them feel safe enough to stay put.